***NOTE*** DUE TO HIGH DEMANDS THIS ENGINE KIT WILL BE SHIPPED OUT MARCH 20, 2015. 4.0 hp 2 cycle gas/oil mix bike motor kits. 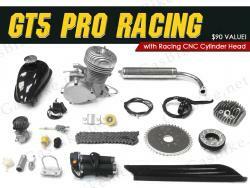 GT5 Pro Racing 66cc/80cc Bike Motor Kit: 1/2 gal. gas tank, chain and sprocket, handlebar controls, mounting hardware package and instruction sheet. Total wt. is 24 to 27 lbs. Starting your GT5 Pro Racing 66cc/80cc Bike Motor Kit (Standard Finish): Pedal normally or use engine power at your option. The engine starts quickly when the handlebar clutch lever is released while pedaling. Twisting the throttle controls the speed to 35 mph. Speed depends on rear sprocket ratio and weight of rider. GT5 Pro Racing 66cc/80cc Bike Motor Kit (Standard Finish) fits best on bikes with 25 to 30mm diameter 70 degree Vee type frames but can be installed on larger diameter tube frames with modifications. “Looks Cool” on the older cruiser type coaster brake bikes. This bike motor kit comes with everything that you'll need except gas and oil! You will be able to stop or start the engine as you ride. There is no rope pulling needed and it gives more speed and gets around 150 miles on a gallon of gas. Please Tell a Friend about this product and help spread the word about Motorized Bicycles. How are angle fire slant head motors different? The spark plug at the top is at a 45 degree angle instead of straight up. This gives the motor higher compression and adds up to an extra 3 MPH. Get your GT5 Pro Racing 66cc/80cc Slant Head Bike Motor Kit (Standard Finish) now while supplies last at this price. 4.0 HP. - Speed depends on rear sprocket ratio and weight of rider, weight of bike, the climate and the terrain being ridden. This 48cc bicycle motor engine kit is about 8.5" height 7" length 5" width and fits on most standard 24" – 26" or 25mm 29mm frame bicycle frame tubes. Larger frame size requires drilling into bike frame and use the universal face plate. This engine kit only adds about 24 lbs to your bike.